New developments in SAP's procurement portfolio, an inspiring use of their technology in rural South Africa, and Services Procurement-related enhancements, and more. This is Part Two of my reporting on some of the things I learned at the ‘SAP Insider Supply Chain and Procurement conference.’ In Part One, I talked about new developments in SAP’s Supply Chain Management capabilities. Here we explore their procurement products. Emily Rakowski, SAP’s Senior Director for Procurement Solutions Marketing, delivered an excellent keynote speech outlining what’s new in their Procurement portfolio of products. She covered a number of customer success stories, such as We Energies saving an average of 22% through auctions, and Pitney Bowes going from 25% to 75% spend under management and saving over $250M via improved process efficiencies. 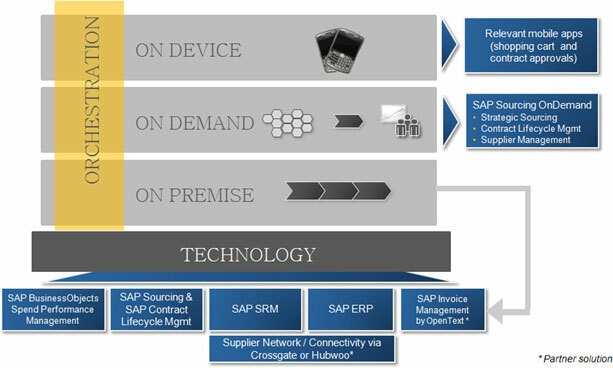 Ms. Rakowski then displayed a slide (see Figure 1 below) showing SAP’s various procurement and sourcing products and how they related to SAP’s strategy for hybrid software consumption models. SAP has a pretty comprehensive end-to-end suite of source-to-pay products, and their portfolio has a lot of ‘moving parts,’ so it is helpful to see how they interrelate. During the last decade, SAP realized that they can’t build everything themselves. That is reflected in this suite, where some components come from acquisitions, some are available through partnerships, and some were developed in-house by SAP. The old purist philosophy of one monolithic system is gone. In the process, there is some temporary sacrifice in integration and UI consistency for the sake of acquiring best-of-breed functionality, especially in the period immediately after each acquisition is made. Having said that, SAP has made considerable investments and has made good progress in integrating their suite of products. SAP’s Spend Performance Management (SPM) is SAP’s spend analytics product, developed in 2007. It is based on SAP BW with an Adobe Flash user interface, and comes with pre-built data extractors for SAP spend data in SAP ERP and SAP SRM. SPM 3.0, due in Q2 2011, will add ‘what-If’ simulations, more advanced analytics, embedded BusinessObjects dashboards, and real savings tracking. Also included is Data Enrichment Classification (DEC), a new UI-based tool which is ‘productizing’ SAP’s data cleansing and classification services which have been available since it acquired Analytics Inc. in 2008. This tool allows users to enrich the data on the fly—if they find something mis-categorized, they can go in and update the classification right there when they find the problem. We will cover SPM in an upcoming report on spend analytics. A Rapid Deployment Solution1 for SPM is available to go live in 10 weeks at a fixed scope and fee. SAP Sourcing OnDemand is based on the Frictionless Commerce suite, acquired by SAP in 2006. It includes three packages—Strategic Sourcing, Contract Lifecycle Management, and Supplier Management. SAP makes this functionality available in either On Demand or On Premise versions, which share the same codebase. Improvements in the last two versions of the Strategic Sourcing module (Waves 7 and 8) include better usability, improved formula-based pricing, improved workflow for supplier on-boarding, and new BusinessObjects-based dashboards. Improvements to the Contract Lifecycle Management module include new content controls (in MS Word documents), enhanced data synchronization, electronic signatures via partner EchoSign, and enhanced clause change management. The Procure-to-Pay functions are not part of the On Demand suite, but rather are contained in SAP SRM and SAP ERP. New features in SAP SRM version 7.0 and SAP SRM 7.0 enhancement pack 1 include improvements to usability (shop on one page), enhanced support for services procurement, offline bidding, embedded analytics, and the availability of shopping carts as part of SAP ERP. MRP-driven procurement can also be routed through SRM which can then aggregate that direct spend along with the requisition-based indirect spend. SAP partners with OpenText to automate invoices. Paper invoices, fax, and electronic invoices are all driven through the same process. Siemens uses SAP SRM as a shared service on top of all their ERP back ends in order to centralize management of POs and spend. SAP has put effort into simplifying the shopping and requisitioning experience by developing both ‘three-step shopping’ and ‘shop on one page,’ enhanced comparative views of products, and a persistent running shopping cart always visible. In addition, they allow shopping cart approval on mobile phones, letting the user view the workflow, scroll to look at details and pictures, and approve or reject purchases. Over 25,000 of SAP’s customers manage procurement functions with SAP ERP and SAP SRM, making this function one of the most commonly used by customers. A Rapid Deployment version of SRM is available to go live with the solution in 10 weeks at a fixed scope and fee. Maybe partly because I am a supply chain risk geek, I thought SAP’s pilot solution Supplier InfoNet was the most innovative new thing I saw at the conference. (OK . . . maybe tied with the South Africa project described below.) Participating companies share their procurement data with SAP. This can include what they are buying, from whom, the suppliers performance data (such as on time delivery and quality), and other data. This highly confidential data is anonymized and aggregated. With all that data, SAP can now provide predictive analytics and early warning indicators. For example, if several customers are all seeing quality or delivery issues with the same supplier, it could be a red flag that action is needed. To the extent that there is participation by tier one and tier two suppliers, it provides visibility into the sub-tiers as well. The data feeds are nearly real time, not delayed. 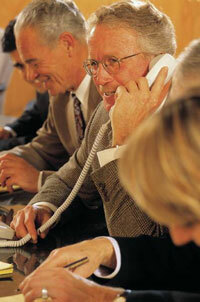 SAP Supplier InfoNet is currently in pilot through 2011. For this pilot, the focus is the aerospace, manufacturing and high tech industries. In these industries there are a large number of suppliers, many of them shared in common between the primary OEMs, so these are a natural fit. If you think about the volume of transactions that flow through SAP systems worldwide, this could provide some amazing insights that have not been possible in the past. Now I’m going beyond what SAP announced, but it seems possible that this data and other SAP data, collected across an industry, could be used to provide value added services such as visibility into overall market demand, delays, potential shortages, etc. I’m getting ahead of what SAP actually announced at the show, but the possibilities for this concept seem quite exciting to me. This was one of the most inspiring parts of the conference for me. We saw part of a video clip on how SAP is supporting the formation of local buying cooperatives in rural South Africa. We’re talking way out in the sticks—dirt roads, miles from any cities, no phone lines . . . but generally good GSM mobile phone coverage. The cellular companies have figured out that there is money to be made in underdeveloped regions. Many villages have small grocery stores, called ‘spaza shops,’ that sell bread and other basic commodities. There are over 100,000 spaza shops in South Africa. Normally, when they need to restock their supplies, they have to hire a taxi to drive them into town to purchase the goods. As you can imagine, that takes quite a bite out of their very modest revenues. The South Africa Living Lab (an initiative of EU’s Collaboration@Rural) is organizing buying cooperatives using SAP’s technology to allow reordering of stocks using SMS messages on the shop owner’s mobile phone. The shop owner types in the name of the store, PIN, the amount and code of the products needed, etc. This saves them the time and expense of driving into town to place orders. Their orders are pooled together, so they have better buying power, and the savings are used to pay for delivering the goods directly to the shop. In this way, SAP is helping to provide an automated procurement system in very rural, low cost settings. It is helping the lives of these store owners. At ChainLink, we have always been big on the potential uses of mobile technology, especially in developing and third world rural areas (see mobile healthcare). SAP’s Suzanne Miglucci (Sr. Director, Procurement Solutions Marketing) described SAP’s Services Procurement capabilities, which is not a separate product or module, but rather consists of a variety of capabilities embedded in SAP SRM and SAP ERP. Services procurement (e.g. various marketing services, maintenance, legal, facilities, repair, and other services) has special requirements. For example, exact requirements like quantity and duration may not be defined at the time of sourcing, Service Level Agreements (SLAs) need to be incorporated into the contracts, and there is a need to allow change orders. Then there is the challenge of managing supplier compliance. When buying goods and materials, the buyer manages the process and supplier performance. With services, the end-user is often the one managing the supplier, and they are often not nearly as skilled at making sure the supplier is complying with the contract. It is frequently the largest category of unmanaged spend in a company. For non-manufacturing companies, services can comprise 75% of their spend. And without good management, most of it is off contract. Many companies have worked hard making improvements for direct and indirect spend. Now services spend is their ‘last frontier,’ ripe with opportunities for savings. But it is not so easy. Contracts may be filed away in a cabinet or in a Word document on someone’s system. Many buying decisions are made ad hoc at the local level (“My cousin Vinnie has a landscaping service . . . we’ll hire him to mow the lawn for a couple of months until we figure out which supplier we’ll use for the long term . . .”). The percent of indirect spend influenced by procurement personnel is typically 50% or less; best in class is 70%. Ms. Miglucci said that SAP enables central management of services spend, while still empowering the end-users to manage the suppliers as most of them would like to. It is integrated into the processes they are already doing, such as plant maintenance functions in ERP or shopping cart functionality in SRM (service items can be set up in the catalog). This makes it ‘hands free’ for the end-user, rather than a separate extra step or different tools than they are used to using. In ERP 6.0 EHP5 (Enhancement Pack) and SRM7.0 EHP1 there are a number of enhancements to support services procurement. These are designed to allow centralized management through distributed ERP instances. SRM now allows you to leverage complex services structures/hierarchies from SAP ERP through all the processes in SAP SRM. This is critically important for services procurement. At the header level, you may want marketing services such as writing, web development, or web hosting with some common sets of elements. Then down at the level of hosting, you may need SLAs, line item actions, etc. Now, when a requisitioner wants their marketing firm to deliver a brochure, they have the means to specify how they want it, and it shows up as a line item under ‘Marketing: Writing,’ that matches the request. This new connection between the hierarchies allows customers to manage services more seamlessly in SAP SRM rather than in their individual ERP instances. This all can be done without needing to redo existing contracts; the SRM contract management system can import contracts and line items from ERP using specific criteria (“get all of the contracts of this type from these specific suppliers”). In this process, the system can check for duplicates of the same contract that might exist in more than one system. You can also import contracts from the bidding engine RFx data. There are multiple ways to get all of this contract content into the SRM system. Then you can push back into the ERP system the part of the contract that you need to execute against with the terms and conditions centrally managed from the SRM system. This is done by selecting the contract and specifying the distribution; which specific line items and which ERP system and/or business unit they should be sent to. Now, even though you have the contract terms and information in all the ERP systems, they are also in the centralized repository and can easily be distributed into specific catalogs. This can be done at line item levels (not necessarily the whole contract) providing the flexibility needed so that each ERP system/user only sees what is relevant for them. It becomes part of the approval workflow process, which can be reviewed by the buyer. After the services have been performed, the release of funds comes back to the central procurement function. Now a firm can see globally what was spent while still allowing the users to do what they need to in the ERP system. This would enable, for example, an alert to appear when spending nears a certain level, in order to take advantage of volume discounts. SAP has also added expressive bidding (see Expressive Bidding Technology for Specifying Outcomes) in the SAP SRM bidding engine. Expressive bidding allows the supplier to ‘break the mold’ at the line item level in their response. The buyer may have an idea what they want, but this allows the supplier to creatively meet the need in a different way. The supplier can make alternate suggestions, which might be much better than anything the requisitioner or buyer thought of. Expressive bidding also allows for supplements and substitutes. The supplier can submit multiple alternatives, giving the buyer different choices and combinations. SAP lets users compare the responses manually using weightings. You can do what-if analysis with the weightings. The comparison weighting might be say, 50% on prices, 20% on SLA, 30% on something else. When the bid comes in, you run your calculations to see who wins based on those weightings. Then you can also change those weights and see what happens. You can save several scenarios and compare the outcomes—such as one scenario that emphasizes transportation vs. another that is ‘SLA-heavy’ in its weighting. SAP has a dedicated solution for the public sector (called SAP Procurement for the Public Sector (PPS), which can also be useful in other sectors. As such, several of the PPS functionalities are now part of standard SAP SRM. This includes support for tendering fees (also known as sourcing fees). By charging suppliers a fee to participate in a sourcing event, it helps to ensure that only serious buyers are bidding, and can help offset the cost of analyzing all the responses. It is used in construction to ensure that only suppliers with some skin in the game are participating. The size of the fees can be substantial. The system will collect the money, and can be configured to distribute it back if the contract is not awarded. It can also give it back to the awardee only after they meet performance milestones. SAP also added ‘double envelope bidding,’ which allows the buyer to split the RFx response information into two pieces, such as one for the technical information and another for financial, so that technical evaluators do not see and are not influenced by the cost. Every company must continually reinvent itself in order to survive and thrive. This is especially true in the fast moving and fiercely competitive arena of software and technology, where new contenders are constantly emerging, growing, and preparing to eat your lunch. When you are as big as SAP, reinvention becomes a lot more challenging. It has to be infused throughout the corporate culture through leadership. It seems that SAP has been able to do that pretty well in recent years. It would be a stretch to say that they are nimble, but for their size they’ve been able to evolve remarkably well. And that is one reason that they continue to grow and are able to support such a wide variety of customers. 1 Rapid Deployment Solutions (RDS) are fixed-price, pre-configured software deployments, with pre-configured content, and a standardized step-by-step deployment methodology. For more on RDS, scroll down to the middle of our article on SAP’s Transformation.